Question the norm, do you? According to QWSTION, good answers are always the result of the right question. Recently we had an exclusive interview with Sebastian Kruit, the co-founder of QWSTION. Their collections of backpacks are brilliant with the modern Swiss designs and developed in Zurich for modern functionality, mobility and flexibility in mind. Well, QWSTION started in 2008 when Sebastian Kruit joined forces with the creative dynamics of Swiss industrial designers Christian Kaegi and Fabrice Aeberhard, graphic designer Matthias Graf and Hannes Schoenegger. They are frequent travellers and have been searching for a bag that closes the gap between functional sports bags and elegant fashion bags. QWSTION is not a fashion brand; it is a brand for products. Functionality is the brand DNA or essence for QWSTION, whereby each bag works for business as well as for leisure. According to Sebastian Kruit, when they design the bags they want it to be durable and practical companions to the urban consumer. Therefore QWSTION creates timeless styles and constantly evolve their collection. Why the brand is called QWSTION? We question the norm. Questioning and creating bags for everyday use that are timeless in style. We question the norm in matters of look, function and construction and pursue the integration of these aspects in our designs. So the word question has been phonetically written as QWSTION. It’s a Swiss brand, we want to merge modernistic designs with functionality. In the nutshell we want work with natural materials. Most of our collection is not made of certified organic cotton, while steel and leather are some of the other materials being used to produce the bags. We don’t see ourselves as a fashion brand. We focus more on functionality and sustainability. We want to make life of a traveler easier; it’s a travel solution to solve each travel problems. One bag we can do many things and use it in many occasions of the day. All our bags come with multiple carrying options for example we can carry it in many ways; as shoulder bag, backpacks, horizontal or even vertical. You can completely change the carrying direction to suits your carrying ways and lifestyles. How can we make people’s life more easy when they travel? What is QWSTION design concept? QWSTION designs is very much based on Swiss design heritage which is functionality and minimalist. As you can see, we use simple lines and earthy tones modern metropolitan look. We don't over design our products. We uses natural products because sustainability is a big part of our idea. Is the bag safe for gadgets? Yes we always protect the gadgets of travellers. Inside the bags there are protective sleeves, padding and elastics straps to safeguard your precious gadgets. Where are the material sourced from? Organic cotton material is sourced from Turkey for best quality standards. Our shell fabrics are made of natural fibres such as cotton, hemp and linen, with water-repellent coatings; it’s water resistant. The weaving is done in a German company, which is durable and should last a very long time. The leather is from India with vegetable tanned. Minimal chemicals are used in the process to ensure they are as natural as they come. Natural materials generally tend to have some irregularities, which we embrace as a quality that adds individual character to the look of our bags. How do you understand customer needs and integrate into future products? We listen to customers feedback and if it is viable and good for our product we will implement it. We always have users and people who write to us and we have a shop in Zurich with design office at the back, where customers can actually direct give their feedback about the fabric, color and designs. We do listen to customers' feedback at the same time we also have a very clear idea of what we want to do and our DNA. How long does it take and the process involved from design to producing a new QWSTION bag? We first identify the needs. Then we draw the design and make a prototype. After that we test it. Next step, the prototype is send to factory. Make 5 of them with changes using the original material. The final prototypes are produced and tested. A normal process from start takes about one and a half year, where a lot of details and thought is put into producing every QWSTION bag. Overall we had had a very insightful interview and discussion session with Sebastian Kruit, Co-Founder Of QWSTION Bags. The bags that suit travellers’ daily needs with multiple carrying options, minimalist design and focus on its functionality plus safe for gadget also. 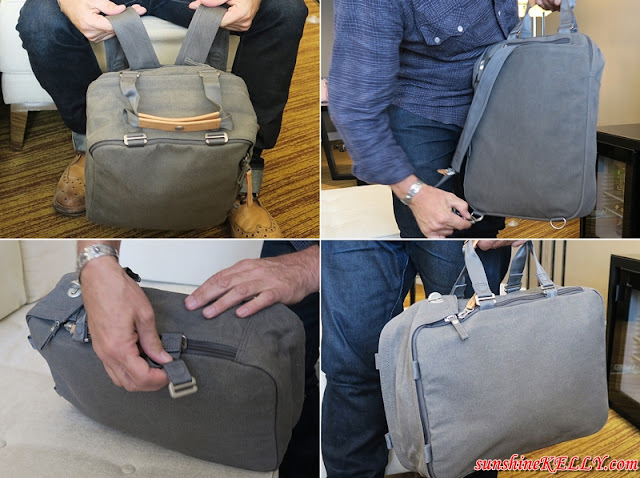 This is a very useful and durable bag especially for those who need to carry laptops and gadget while constantly on the move like me. At the same time look presentable. Omg I love the white bagpack!!!! Soooooooo pretty! I love that white backpack with the black straps!! And it's water resistant? I need it! Oh wow! its even water resistant! good stuff like this totally is a worth buying (for me) lol. I like the philosophy behind this brand: modernistic minimalist designs with functionality. I hope they will venture into mommy bag someday, like diaper bag.